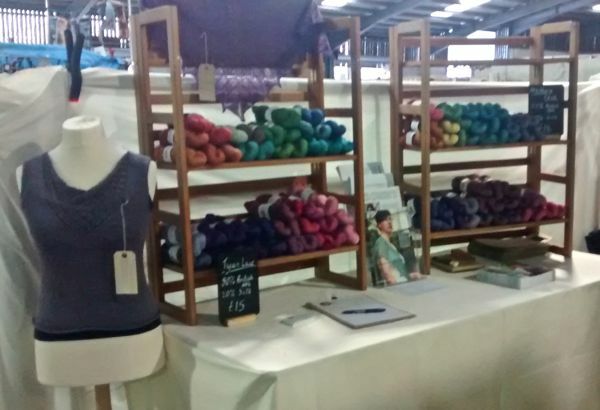 Last weekend was the third Yarndale wool festival in Skipton, and the second time I’ve had a stall. It was a fantastic, if very busy, weekend. I only managed to take a few quick camera phone pictures of my own stall. This year the new banner was hoisted for the first time and attracted lots of oohs and aahs from visitors. All needle felted by hand, no fingers were harmed in the process of making the banner! The beautiful Bonny by Tin Can Knits was on duty at the entrance to the stall, enticing the customers in! Saturday was an incredibly busy day, with lots of dedicated knitters and industry people visiting. I only got to leave the stall for quick loo breaks and a bite to eat for lunch. It was lovely to meet so many customers in person for the first time, especially Marie. The very lovely Karie Westermann stopped by and Amanda Collins aka OwlPrintPanda was a veritable whirlwind through the stall! 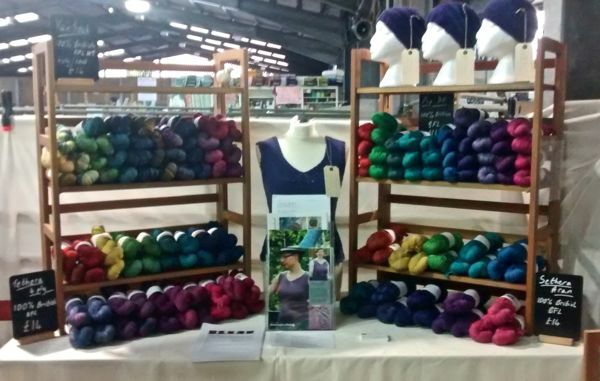 I launched two new bases at the show this year, Pip DK (100% British BFL) pictured above on the top shelf at the right hand side and Sethera Aran (100% British BFL), bottom shelf on the right. These pictures are before the yarn was ravished by the hoards of yarn fans, hungry for a squish of lovely yarns! 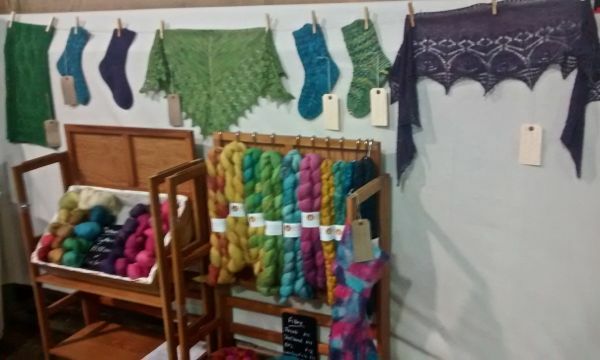 The washing line of samples received lots of lovely comments from customers to the stall, especially the Anisoptera shawl, on the right above, from the Dragonfly collection by Gwen Wagner-Adair. Speaking of samples and finished items, it was lovely to stand at the entrance to the stall watching the crowds going past and spotting all the wonderful hand knitted garments being proudly worn by the visitors. Sunday was a little quieter and I managed to get away from the stall for a little while to have a look around and make some modest purchases for myself. 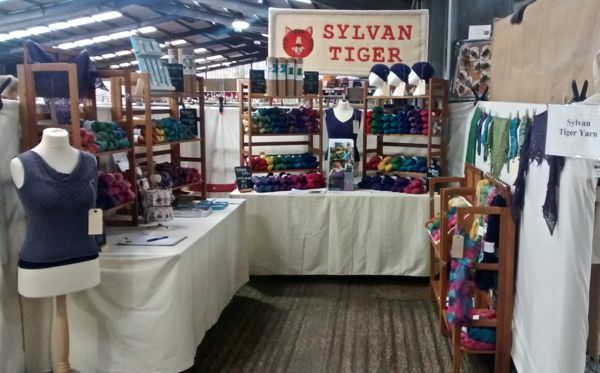 Though I didn’t manage to take any photos from elsewhere around the show, have a look on Twitter for #yarndale to get a flavour of the event. Thanks to all the organisers and volunteers for another fantastic show, looking forward to next year already! (After a bit of rest and putting up of the feet for a while!!) The Etsy shop is back open again now and I’ll be restocking slowly over the next few weeks. This entry was posted in Dyeing, Knitting and tagged British Wool, Etsy shop, Hand dyed yarn, Yarndale on Tuesday 6th October 2015 by sylvantiger. This last week has been all about the sock yarn. 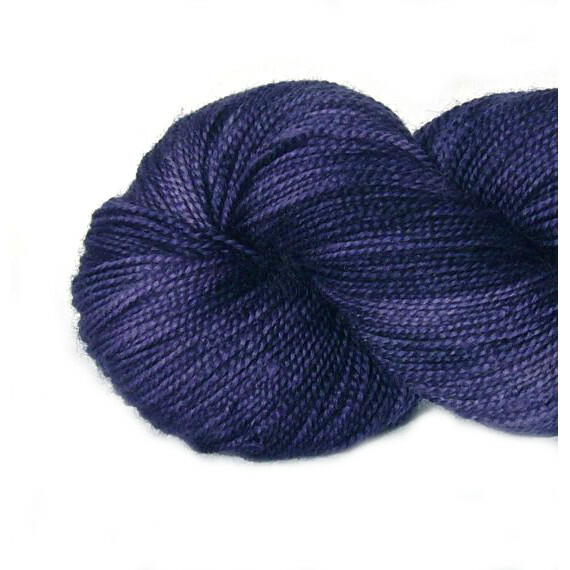 My Yan Sock base is a lovely 100% British Bluefaced Leicester High Twist sock yarn. The high twist gives it that extra bit of sturdiness to help prolong the life of your precious hand knit socks. The fibre of the Bluefaced Leicester sheep has one of the longer staple lengths of the sheep breeds, which means it’s less prone to felting than other fibres. All great attributes for socks! 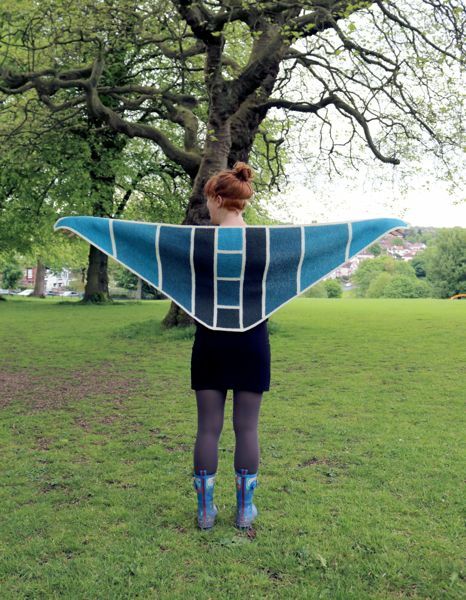 There are three new colours to launch this week, available now in the Etsy shop, drum roll please…. 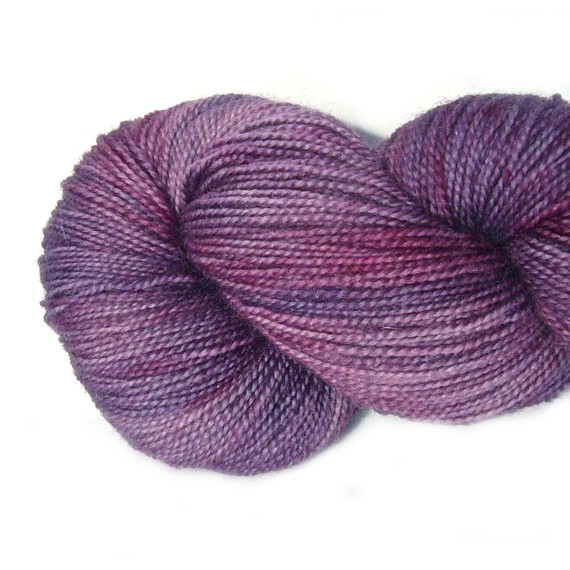 A dusky pinky purple with brighter pink and purple highlights produced from a combination of Lac and Saxon Blue. Named for a random conversation on Twitter! This purple is created using Logwood Purple, with the variations and highlights produced by the use of different modifiers such as iron and sodium carbonate. A vibrant mixture of pink, purple and blue. All created with Cochineal, Logwood Purple and Saxon Blue. From the way the dyes have mixed and moved around in the pot, there are lots of subtle variations to the colours. 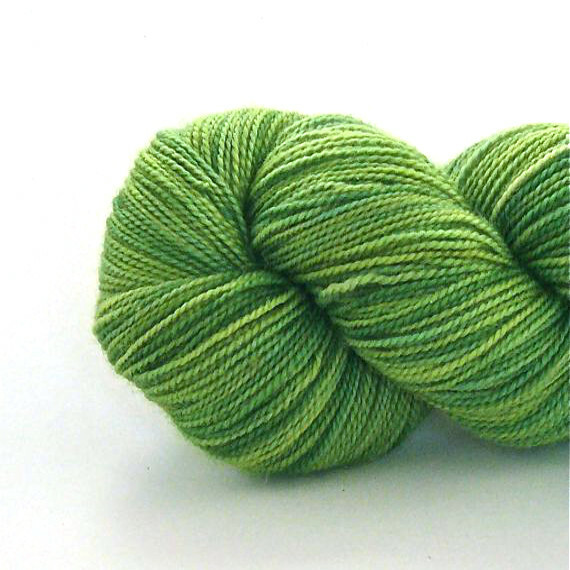 This would make a great pair of bright and cheerful socks!. 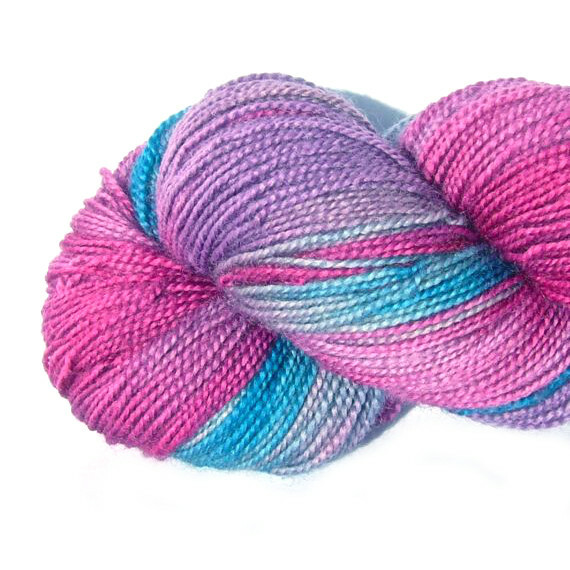 As well as the new colours, I’ve restocked popular colours including Summer Berries, Deeper Under the Sea and Plumlicious. 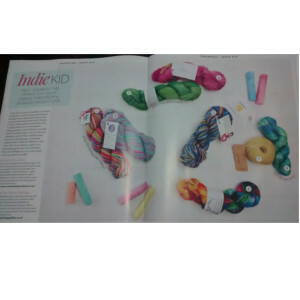 And, if that wasn’t enough socky goodness, Yan Sock in Spring has Sprung appears in an Indie Dyer feature in the March issue of Let’s Knit magazine! 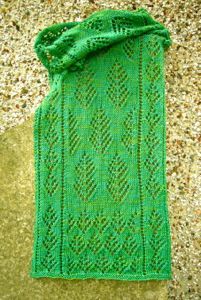 This entry was posted in Dyeing and tagged British Wool, dyeing, Etsy shop, Hand dyed yarn on Monday 23rd February 2015 by sylvantiger.